For the individual settlement, see Sunderland, Tyne and Wear. 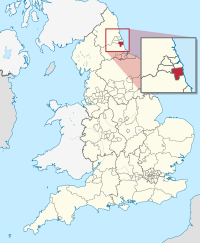 The City of Sunderland (/ˈsʌndərlənd/) is a local government district of Tyne and Wear, in North East England, with the status of a city and metropolitan borough. It is named after its largest settlement, Sunderland, but covers a far larger area which includes the towns of Hetton-le-Hole, Houghton-le-Spring, Washington, and a range of suburban villages. The district was formed in 1974, titled the Metropolitan Borough of Sunderland, as part of the provisions of the Local Government Act 1972 and is an amalgamation of four former local government districts of County Durham. It was granted city status in 1992, the 40th anniversary of the Queen Elizabeth II's accession. The city had a population of 275,300 at the time of the 2011 census, with the majority of the population (174,286) residing in Sunderland. The 'Sunderland Built-up Area' (including Whitburn in South Tyneside and Chester-le-Street, Ouston, South Hetton and Pelton in County Durham) is quoted alternatively as having a population of around 335,000. The metropolitan borough was formed in 1974 under the Local Government Act 1972 by the merger of several districts of County Durham - Washington Urban District, Houghton-le-Spring Urban District and Hetton Urban District - with the County Borough of Sunderland. The metropolitan borough was granted city status in 1992, the 40th anniversary of the Queen's accession. At the Queen's Golden Jubilee the city petitioned to be allowed a Lord Mayor, but was unsuccessful. Although the city does not have a Cathedral, as it is located in the Diocese of Durham, it does have Sunderland Minster. Between 1939 and 1945 the Wear yards launched 245 merchant ships totalling 1.5 million tons, a quarter of the merchant tonnage produced in the UK at this period. Competition from overseas caused a downturn in demand for Sunderland built ships toward the end of the 20th century. The last shipyard in Sunderland closed in 1988. HMS Ocean, the Royal Navy's biggest warship, is Sunderland's adopted ship. In March 2004 it was granted the freedom of the City. St Benedict Biscop was adopted as the City's Patron Saint in March 2004. Sunderland is twinned with: Essen, Germany and Saint-Nazaire, France. It also has Friendship Agreements with Washington, DC, USA; and Harbin and Nanjing, both in the People's Republic of China. Sunderland and Washington share historical links, as the ancestors of the first President of the United States of America, George Washington, lived in Washington Old Hall, which is within the municipal boundaries of Sunderland. The Mackem accent and dialect is often mistaken for Geordie by people not from the region, as the two tongues sound exactly the same in pronunciation and diction. The dialect also has several variations between different areas of the City, as demonstrated when the hoax tapes purporting to be of the Yorkshire Ripper were analysed. The tapes were made by a man who came to be known as Wearside Jack, and were thought by linguistic experts to be made by someone specifically from the Castletown area of Sunderland. When the perpetrator, John Humble was eventually caught he confirmed that he did indeed attend school in the Castletown area of Sunderland in his childhood. Lewis Carroll was a frequent visitor to the area. He wrote most of Jabberwocky at Whitburn as well as "The Walrus and the Carpenter". Some parts of the area are also widely believed to be the inspiration for his Alice in Wonderland stories, such as Hylton Castle and Backhouse Park. 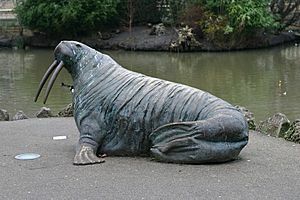 There is a statue to Carroll in Whitburn library. Lewis Carroll was also a visitor to the Rectory of Holy Trinity Church, Southwick; then a township independent of Sunderland. Carroll's connection with Sunderland, and the area's history, is documented in Bryan Talbot's 2007 graphic novel Alice in Sunderland. More recently, Sunderland-born Terry Deary, writer of the series of Horrible Histories books, has achieved fame and success, and many others such as thriller writer Sheila Quigley, are following his lead. The Salford-born painter, L. S. Lowry, was a frequent visitor, staying in the Seaburn Hotel in Sunderland. Many of his paintings of seascapes and shipbuilding are based on Wearside scenes. The Northern Gallery for Contemporary Art on Fawcett Street and Sunderland Museum and Winter Gardens showcase exhibitions and installations from up-and-coming and established artists alike, with the latter holding an extensive collection of Lowry's work. The National Glass Centre on Liberty Way also exhibits a number of glass sculptures. The Bath-based writer, Dan W.Griffin was a student at Sunderland University between 1991 and 1995. His experiences are described in his book, No stranger to the P45. Sunderland has produced a modest number of musicians that have gone on to reach international fame, most notably Dave Stewart of the Eurythmics. Kenickie, which featured Lauren Laverne on vocals, also achieved a top ten album and wide critical acclaim in the mid-to-late-1990s. In recent years, a thriving underground music scene in Sunderland has helped the likes of Smalltown Heroes, The futureheads, Field Music and more recently Frankie & The Heartstrings gain national recognition. Other famous Sunderland musicians include punk rockers The Toy Dolls, who broke the top five of the charts with "Nellie the Elephant" in December 1984; the punk rock band Leatherface; the lead singer of dance outfit Olive, Ruth Ann Boyle, who achieved a UK chart-topper with "You're Not Alone" in May 1997, and has gone on to work with fellow chart-toppers Enigma; A Tribe of Toffs made number 21 with their cult hit "John Kettley is a Weatherman" in December 1988. On 7 and 8 May 2005, Sunderland played host to BBC Radio 1's Big Weekend concert - the UK's largest free music festival. The event, held at Herrington Country Park in the shadow of Penshaw Monument, was attended by 30,000 visitors and featured Foo Fighters, Kasabian, KT Tunstall, Chemical Brothers and The Black Eyed Peas. The Empire Theatre sometimes plays host to music acts. In 2009, it hosts Jane McDonald and The Drifters among others. The Sunderland Stadium of Light has hosted regular concerts since 2009, including the likes of Oasis, Take That, Coldplay, Kings of Leon and Red Hot Chili Peppers. The Sunderland Empire Theatre, opened in 1907, is the largest theatre in the North East, reopened in December 2004 following a major redevelopment allowing it to stage West End shows such as Miss Saigon, Starlight Express and My Fair Lady, all of which have been performed at the Empire. 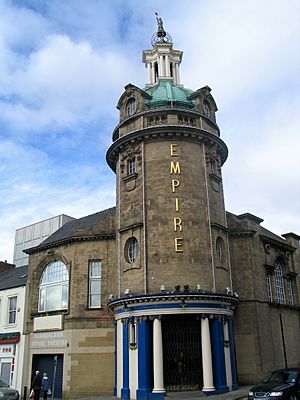 The Empire is the only theatre between Leeds and Glasgow large enough to accommodate such shows. It has also played host to an annual season from the Birmingham Royal Ballet for over ten years. The Royalty Theatre is the home of the amateur Royalty Theatre group who also put on a number of low-budget productions throughout the year. Renowned film producer David Parfitt belonged to this company before achieving worldwide fame and is now a patron of the theatre. The Empire also played host to the final performance of comic actor Sid James, who died of a heart attack whilst on stage in 1976. City of Sunderland Facts for Kids. Kiddle Encyclopedia.